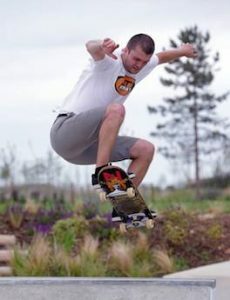 Jason Emery is the owner of Let’s Go Skate Community Interest Company (C.I.C.). He has a burning passion for skateboarding and wants to share it with as many people as possible. Whilst working in a supermarket as his first job after finishing college, Jason saw there was a surge of interest in skateboard tuition. So he got a job as an instructor for a London-based company, providing skateboard lessons and really enjoyed it. 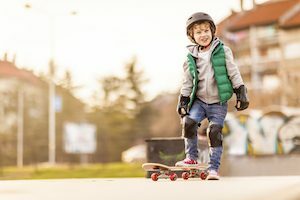 Jason particularly enjoyed teaching children how to skateboard, ensuring the tuition was entertaining and fun, without putting too much pressure on any of his pupils. “As obesity levels continue to rise in the UK, more alternative physical outlets such as skateboarding need to be explored. Not everyone wants to play as part of a team, or have a manager tell them how to perform, preferring to express their individuality through skateboarding”. As more and more children signed-up for lessons, and more schools expressed interest in his services, he quickly realised that there was enough demand to justify setting up on his own as a sole trader. However, he needed help in find a sustainable business model that worked for bringing skate-boarding lessons to all children, not to preclude any child from getting involved due to the cost of lessons. At it’s core Let’s Go Skate is about offering people the chance to try out skateboarding who may have never given it a go otherwise. The majority of customers have been children who fancy trying something new and different. On attending a meeting to discuss providing skateboard lessons at the newly built skate park in Alconbury Weald, Jason was given a flyer promoting free Outset business workshops. He attended a workshop the following day as he felt he lacked important business knowledge needed in running his new business. Outset Huntingdonshire offers a range of business start-up support to help entrepreneurs gain knowledge, skills and confidence they need to start and sustain their own business, thanks to funding from the European Social Fund, Skills Funding Agency, Huntingdonshire District Council and Cambridge County Council. Jason says that he enjoyed being in a room with other like-minded individuals who were also looking to set up a business. Because setting up your own business can be a daunting prospect at first, he found it comforting to be around others going through the same process. He says that being able to listen to others’ stories and give advice to them was memorable, and allowed him develop new ideas. “The Outset workshops did a good job of getting me focused on the nitty gritty sides of running a business and learning what lots of the terms mean which were jargon to me previously”. Outset explored whether a social enterprise model might work. Through our research, we found a social enterprise skateboarding business in the Bristol area, which had traded successfully for several years. Talking to the Director of that business it was clear that a social enterprise type model might work for Jason if it could access the right funding. Outset helped Jason explore a Community Interest Company business model, and provided advice on how to set up Let’s Go Skate as one. Jason says that to discover that it is possible to set up as a Not for Profit Company, eligible to receive grants and funding, has been fantastic. The future looks bright for Let’s Go Skate? Jason’s vision it to use Let’s Go Skate to positively promote skateboarding and show off how talented skateboarders really are. Jason is currently looking for funding and has approached Huntingdon Forum, who provides support to social enterprises in the area. He plans to use funding to offer more free sessions for youngsters to give skateboarding a go. Through the help of Huntingdon District Council, he has found a possible venue for indoor skateboarding lessons during the winter months. However, Jason’s ultimate goal is to open up an indoor skate park that can be used all year round, allowing everyone to continue skateboarding even when the weather is wet and cold. He expects the inclusion of skateboarding in the Tokyo Olympics in 2020 to raise interest in skateboarding to new levels in UK. Having enjoyed great success this summer at Alconbury Weald, he wishes to expand his services and work with councils to help open new skate parks in towns that don’t have one yet.